Small towns can be great places to retire and live out one’s golden years — or not. A community with nearby family and lifelong friends is what draws or keeps people there. It’s more difficult to live there when appropriate and well-located housing, good sidewalks, and alternative modes of travel for non-drivers aren’t. Richard Milgrom, a University of Manitoba associate dean (research) in the faculty of architecture and a Centre on Aging affiliate, specializes in the planning and design for age-friendly communities, and has been studying the age friendliness of Manitoba towns and cities for years. There’s an important distinction to be made between ‘community’ and ‘place’ when we talk about aging in rural Manitoba, he said. “There’s a lot of towns in Manitoba where I’d say the communities are very age friendly,” he said. Milgrom spoke during a recent Centre on Aging research seminar in Winnipeg earlier this month, where he described research gathered through the Age Friendly Manitoba Initiative to document what Manitobans themselves say they need in their communities to age well. A key need for those who either can’t or don’t want to drive, is for options to private vehicles. That’s where the community — volunteers and family — are stepping in because the place offers no alternative. But that need also points to a larger problem. These places lack transit but it’s a need arising due to the way towns and cities are planned and built. Transportation needs are key in all discussions about age friendliness, Milgrom said. In an interview he added that as the province pursues its carbon emission reduction strategy there needs to be much more emphasis placed on lessening reliance on individual vehicles. From a planning perspective, what lack of transportation also points to is the way housing is located too far for people to walk where they want to go, and a widespread trend of commercial development creeping to the edges of towns. 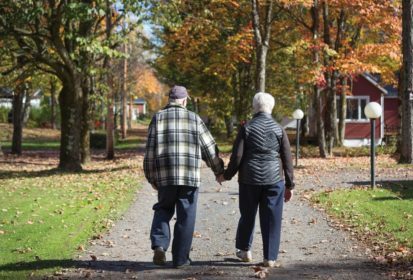 Connie Newman, executive director for the Manitoba Association of Senior Centres said in an interview an issue older adults regularly raise is an absence of sidewalks, or the lamentable condition in some places. “When people have to walk on busy roadways or even trunk highways that’s a huge safety issue,” she said. But it’s one thing for small villages and towns to start changing the way they make planning decisions; it’s another to find resources to make these places more age friendly. The Association of Manitoba Municipalities has recently flagged the need for more cash to implement provincial accessibility legislation and the municipal lobby group is also pushing for more support for regional and sustainable transit services for all residents, including those who must travel for medical reasons, and those with mobility issues. Complicating everything is that these needs are arising within a context of rural depopulation, points out Milgrom. He shared maps during the seminar showing broad swathes of the province where older adults now outnumber other age groups too. The other challenge is starting public discussions about broader, regional-scale needs, he said. But if we don’t make the ‘place’ more supportive, it ultimately means having to choose between it and the ‘community’ we’d prefer. That’s not really a choice, said Milgrom. “That’s forced relocation and doesn’t feel very good,” he said.